Think I've solved the problem with using the EFCS and flash on the Nikon D850 (should work on the D500 as well). This is very preliminary, but wanted to get this out to the folks that are struggling getting EFCS and flash to play together. My setup is a Stackshot controller running a modded THK 20 rail, I run the controller from Zerene. The D850 is triggered directly thru the Stackshot controller with a cable I made that goes from RCA plug (Stackshot side) to the standard Nikon multiple pin connector. I used an eBay remote button and added the RCA plug and cable to the connector. This was my standard cable I use for the D800, D500 and D850 bodies with the Stackshot controller. My lighting setup is 5 manual studio strobes that are set for optical triggering for this experiment (they are normally also RF triggered but this was not used). A seperate Flashpoint XPLOR 600 studio strobe was used as an optical trigger (later I'll incorporate it into the actual setup, but for now just used as a trigger for the other strobes). The XPLOR was set to manual at 1/256 power and RF triggered from the Flashpoint R2 hot shoe transmitter. I used the delay mode in the XPLOR and set this to 0.38 seconds (after much experimentation). The R2 is not on the camera hot shoe and is triggered by a sync cable that is wired to the same cable that triggered the camera (Stackshot cable to Nikon connector), the cable is wired in parallel with the camera trigger from the Stackshot RCA plug. The D850 is set to Live View with EFCS, Shutter Delay Exposure of 0.2 seconds and an shutter of 1/10 second. The idea is that when an exposure trigger is issued from the Stackshot controller to the camera, this also triggers the R2 transmitter which sends a RF signal to the XPLOR strobe. The strobe waits a predefined amount (0.38 second in this case) and fires a flash which triggers the other manual flash for the exposure. 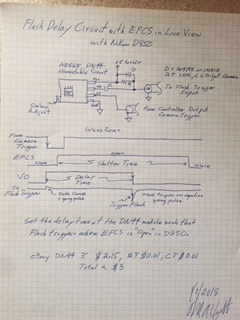 I don't need to use the RF trigger except I don't have the right connector for the XPLOR external trigger now, but have the proper connectors for the setup as I described. Lots more details on this, and why it works and so on, but for now this is all I can post. The Yellow connector is the RCA plug for the Stackshot controller, the Black and Silver is for the Nikon, the other two are for triggering the RF transmitters I have. Thin barrel plug is for Neewer 433MHz and other is for Flashpoint R2 trigger (standard sync plug). Don't worry about the diode, this is for older Nikon bodies, not needed. Just simply wire up the cables in parallel with the Stackshot output and you are good to go. Be very careful you don't short out things and there isn't much space for all the extra cables (originally it only had the Nikon cable as it's a Nikon remote switch! ), very tight wiring. 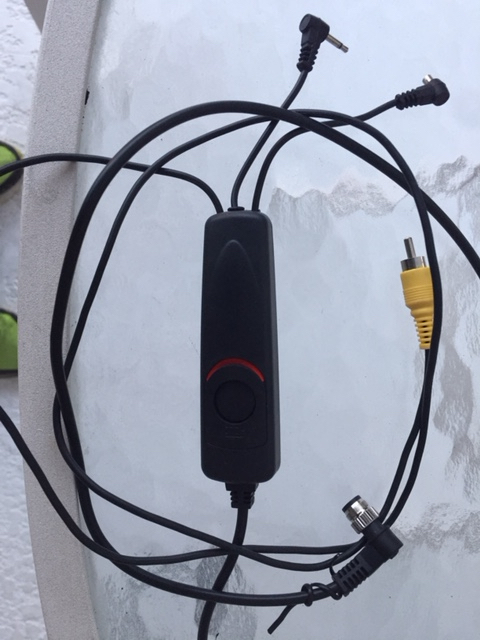 This remote switch comes in handy since you can fire the camera and strobes by just pressing the button (shown locked in Red position) while fiddling with the setup. A very informative post, but I find that my D850 works well with EFCS and flash without jumping through hoops. To enable EFCS one sets the release mode to Q and turns on EFCS (D6 in the custom settings). In view finder mode, one presses the shutter and the picture is taken with flash. Shutter delay is advisable so that the mirror is raised before the picture is taken. With LV the process is similar but the mirror is already up. For stacking, I would like to use the electronic shutter. To do this, I would enter live view and enable silent live view photography, Mode 1. However, there is no flash synch in this mode and your method would seem to enable the flash. Sorry, but I must be missing something and would appreciate your clarification. Yes this is specifically for stacking use, sorry I didn't clarify that. Soon I'll be doing a complete stacking session this way, and see how the results turn out. Should mention the reason for setting the Exposure Delay Mode to 0.2 second and not just leaving it off is I think that this may produce a more accurate exposure timing. I did see more variability without using the Exposure Delay Mode. 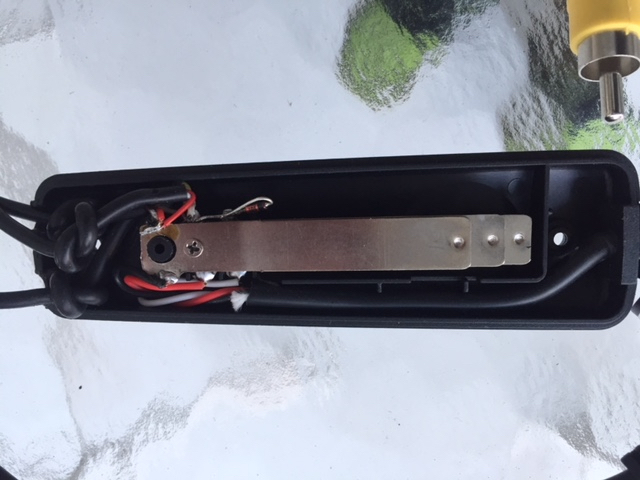 This can be shown by setting the XPLOR delay such that the frame has a darkened horizontal edge in the image, this is the effective electronic shutter curtain. Any timing variation will show up as vertical movement of this dark edge. This is also the reason for the long shutter time, to allow the timing variations between shots to fall within the effective shutter open window, the exposure is still controlled by the flash period/exposure and not the shutter time as is the case when using flash in general. If you already have the Flashpoint XPLOR 600, then the only additional cost is an inexpensive cabled remote for you camera and a couple cheap cables. The concept should work equally well with the WeMacro and MJKZZ controls, but I haven't tried it. Anyway, hopes this helps explain my thinking behind this technique. Now I have a few minutes, here's a more in depth discussion of using the EFCS of the D850 for stacking use while using camera Live View. For some reason EFCS shutter mode in LV disables the use of the Hot Shoe trigger for flash use, I'm sure Nikon has a reason. The desirable use in stacking would have no mirror flop nor mechanical shutter movement during stacking while using camera live view, thus removing these from the vibration induced blur list. To allow this operation you somehow need to trigger the flash system since the normal camera hot trigger is disabled. Remote triggering of Nikon camera bodies for exposure is by way of an open contact closing, this was usually achieved by a switch, and for automated triggering (like computer controlled stacking) a relay or open collector or drain semiconductor device. The Stackshot, WeMacro and MJKZZ controllers have this feature to remotely trigger the camera exposure for stacking purposes. Normally the camera triggers the flash by the hot shoe and this ensures all things are lined up and timed properly assuming the camera and speed-light/strobe are setup correctly. However the hot shoe flash trigger is disabled in Nikon EFCS cameras when used in LV as mentioned!! To solve this issue the general idea for LV stacking is to use the same trigger command from the stacking controller (triggers the camera to capture an image) to also trigger the flash. It turns out this is very simple to do since the camera hot shoe trigger uses the same "closing contact" method to trigger the flash device. What I've done so far is simply hard wire a cable in parallel with the proper connector for mating to the flash device (or in my case the RF trigger that is usually mounted and triggered on the camera hot shoe) to the closing contact wires that come from the stacking controller. There are many ways to do this, but I use a home brew cable assembly from my Stackshot RCA type connector to the Nikon Multi-Pin connector based upon the cheap ($10) remote switched available on Amazon and eBay. 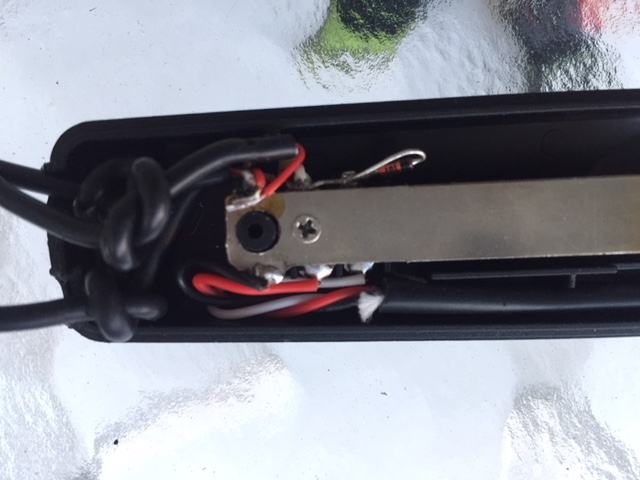 I wired a normal flash synch connector & short cable (standard used in triggering many speed-lights and strobes) in parallel to the wires across the open contact remote switch, also wired a 2.5mm connector for use with another trigger source. These are shown in the above images. When the stacking controller issues a trigger to capture an image to the camera, this will also trigger the flash device simultaneously. When you try this you'll get just a black image!! Why, because the actual optical flash is occurring before the camera can "open the shutter". This happens because the camera isn't issuing the flash command and the flash exposure doesn't have the proper timing to be placing inside the shutter time "window". To produce the proper timing requires the actual flash exposure to be delayed, this is where the flash exposure producing device needs to provide a delay, or by some other external device. The Adorama XPLOR 600 (Godox AD600) studio strobe provides this delay feature among many other useful features, other devices may have this feature but I suspect it's only available in higher end products. By experimenting a little you can find the proper exposure flash delay that will produce the flash optical burst within the shutter time window, and produce an acceptable image. Because of timing variations between the camera to actual shutter window under EFCS and the XPLOR 600 I needed to use a delay of about 0.16 seconds and a shutter speed of 1/10 second. I found that invoking camera Exposure Delay of 0.2 seconds in the D850 and a delay of 0.38 seconds in the XPLOR 600 produced better results as previously mentioned. I'm using the image capture trigger command from the stacking controller to trigger the R2 RF trigger (Godox X1) which then triggers the XPLOR 600 by RF means, so some additional timing uncertain may be involved. You may need to use different XPLOR 600 delay parameters & camera Exposure Delay than what I've used, so experiment some to find the optimum values for delays and shutter speed. You can still use your speed-lights and/or studio strobes that don't have the delay feature if you have at least one Master device that does. Set up all the non-Master devices for manual and S1 optical trigger mode. This will trigger these manual devices on the optical flash produced by the Master device which has the proper delay setup. This works and what I'm using now, the XPLOR has the delay setting and it triggers 5 other manual studio strobes using the S1 optical trigger mode. Anyway, hope this helps clarify how I've setup the D850 for use with stacking under LV and EFCS. Thanks for sharing the information Mike, and thanks for all the time you spent on this! While watching the Rose Bowl Parade I realized that the same technique for capturing a water drop image can be used to enable flash with the EFCS in Live View by delaying the flash command after the exposure has started. Peter at MJKZZ has a water drop controller that should work by delaying the flash until after the EFCS has opened. Another delay solution if you don't have speedlights/strobes with a built in delay function is as shown. This should cost less than $3 from eBay. Another very informative post. Unfortunately, the diagram is too small for me to read. Could you upload a larger copy? Red is taken low here by my "push button", low duration would be timed by the stackshot (or similar) shutter driving output timing you set in the configuration. So no need for a scope to see the timing. Green going low is the trigger for the flash. Optocoupler provides isolation (there would be no common earth necessary). Power comes from camera USB . Yes that should work as well, good idea using the Stackshot control of the trigger width. Also like the idea of using the camera USB +5V for the power instead of an separate power supply. The circuit I drew up could also benefit from your idea of using the USB +5V for power as the current draw is fairly low. Using the optocoupler I chose, the current drain from the USB is very low. Normal Optos are likely to need 5mA instead of this one's 40µA, so the drain (through R3)would need to be higher so the pulse from the capacitor is enough to light the 5mA LED. If isolation were not required then a FET output would enable the draw to be made very low. But I don't like the thought of losing the isolation from the flash. A test may be in order to see how current taken from the camera usb drops the voltage . I doubt it would like a drain near the normal USB's 1A. 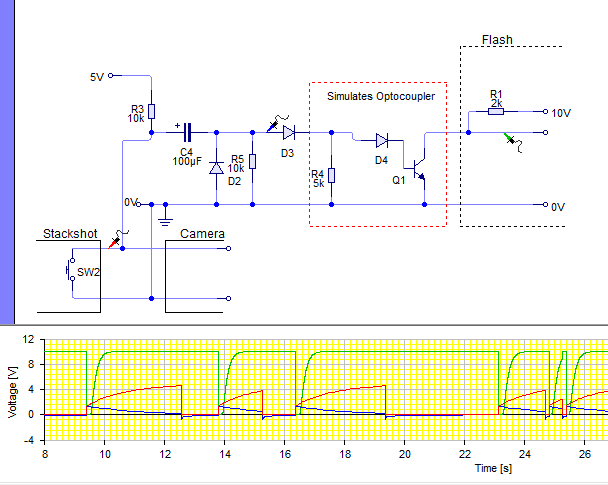 I've got a design for the interface circuit, Delay Trigger Circuit (DTC), will allow the Nikon D500 and D850 to work with flash in Live View under EFCS exposure. At present I'm waiting on parts and will post the schematic and such when things arrive and I've confirmed proper operation. The general concept is as mentioned earlier to simultaneously trigger the camera and DTC feeding a RF Remote Trigger with the exposure command from the Stackshot Controller using the splitting cable fixture shown. 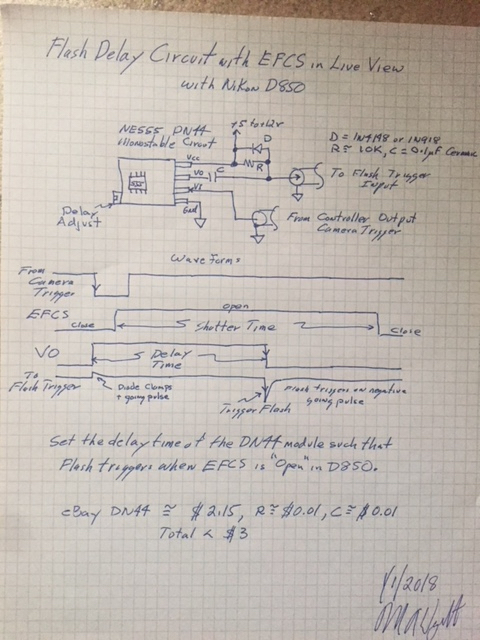 To compensate for the LV to actual shutter opening (145ms for D850 & 103ms for D500) I plan on introducing a simple delay circuit based upon the popular 555 timer, the DTC. 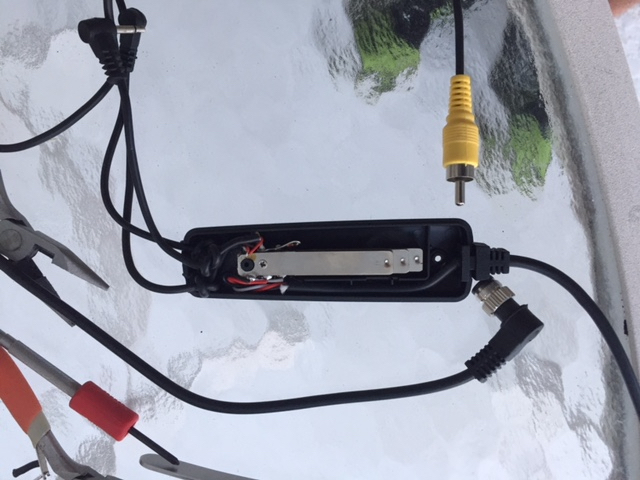 I'll also follow Chris's concept of using a Optical Isolator for the output which will trigger the RF Remote or directly trigger a strobe or flash without the RF Remote, without worry for any ground coupling. Power for the DTC is planned on using the standard 12V used for the Stackshot & WeMacro controllers with a Y power cable, so no extra power required. Anyway, I'll post more details when the parts arrive!! In the meantime I've used my Flashpoint XPLOR 600 built in delay feature to introduce the proper delay. The RF Remote R2 is triggered by the split cable shown, the XPLOR 600 is set to manual with a 380ms delay, while the D850 is set for exposure delay of 200ms, EFCS and LV, with a shutter period of 1/8 to make sure all the optical flash burst resides within the shutter window. The XPLOR output flash optically triggers the other 4 strobes (in S1 mode) so all are somewhat in sync and with the proper delay. I did some test images and this works with the EFCS and LV utilizing the XPLOR strobe as a delay element. The DTC should allow much finer timing and operate with any Remote, Strobe or Speedlight. So all the strobes could be triggered with much finer timing resolution with the RF Remote which should reduce the exposure window somewhat. I've replaced my strobe incandescent modeling lamps with dimmable LEDs to help reduce heat build up and can now watch the initial setup and stacking session with Live View. I leave the LED modeling lamps on and set such that they don't contribute to the final exposure, only the flash optical burst exposes the image, and the setup doesn't get so hot!! 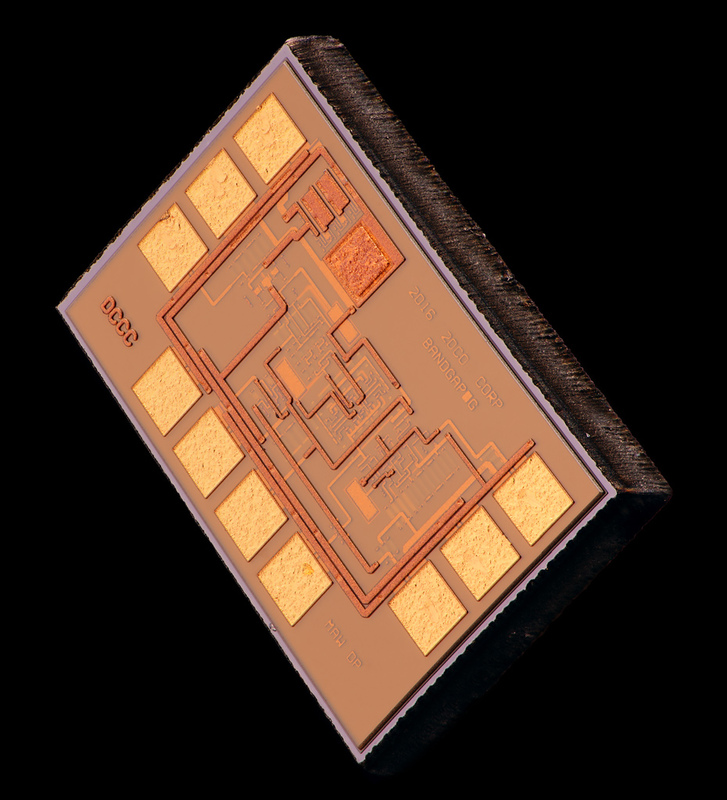 Anyway, all this seems to work well in my first useful session as shown in the accompanying image shot at 20X, the InP test chip (Bandgap Reference) is only ~500 micron long!! Love the light on that chip. Thanks for all the work on this, I am very interested so keep up the good work!